Last night it was 11 runs and 17 hits. Today, eights runs and 16 hits. Then there’s Adam Wainwright, who’s having a resurgence of his own. In seven innings today, he allowed only six hits and two earned runs, striking out four and looking much more like 2009/2010 Adam Wainwright than he did earlier in the season. It was another good day at the ballpark — especially with all the red clothing and chants of “Let’s go, Cardinals” that could be seen and heard. 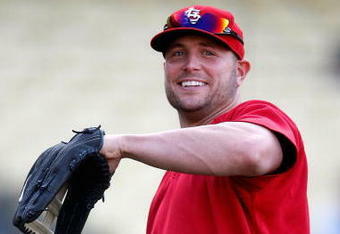 And it was another good day for Matt Holliday. After having three hits last night, he had four more today plus drove in two runs. He was far from alone in hitting today, though. Everyone except Tony Cruz, starting for Yadi at catcher, had a hit. And, with the exception of a Holliday double and Allen Craig’s two-run homer in the seventh, all were singles. The Wrench had three RBI on the day, also driving in the Cards’ final run in the ninth. The biggest inning for the Cards was the fifth, when five consecutive singles by Daniel Descalso, Rafael Furcal, Jon Jay, Holliday and Carlos Beltran scored three runs. Small ball, anyone? Furcal had two hits again today, so — like the team overall — it seems like his slump is over. Raffy drove in a run in the sixth, off Royals reliever Francisley Bueno. Yes, for that inning the pitching match-up was in fact Waino vs. Bueno. Yet it was the Cardinals, and of course Waino, who were bueno in this game. Tomorrow, the Cards will try to continue the hot hitting as they go for the sweep against the Royals. Game time is 1:10 p.m. with Lance Lynn taking on Jonathan Sanchez. Remember to visit Drinking the Royals Blue-Aid for the K.C. perspective on the I-70 series. The tributes in honor of Darryl Kile and the 10th anniversary of his death yesterday have been many, and all are touching. Mine is here, in case you missed it, plus the United Cardinal Bloggers have a link to all the UCB members’ posts on Kile and Jack Buck here. In addition, MLB Network aired an excerpt from a documentary that will be broadcast on July 12 that you can find here. Today, Fox Sports Midwest aired a wonderful piece that includes some priceless footage of DK chatting with some kids in the Cardinals dugout; recollections from Dave Duncan, Andy Benes, Tony La Russa, Mike Matheny, Kerry Robinson and Jason Simontacchi; plus a visual reminder of just how awesome DK’s curveball was — click here for that. And, as a warning, you might need some tissues for the two videos. Not that I want to get ahead of ourselves, but it’s been two weeks since the Cardinals were three games above .500. June 9, in fact. I think people are starting to figure out Lance Lynn. Yes. But, regardless, three games over .500 for the first time since June 9!